In recent years, Toronto has seen quite the influx of Vancouver restaurants opening up in the city. Miku (@MikuToronto), a Japanese restaurant specializing in aburi, is another one to add to the growing list. 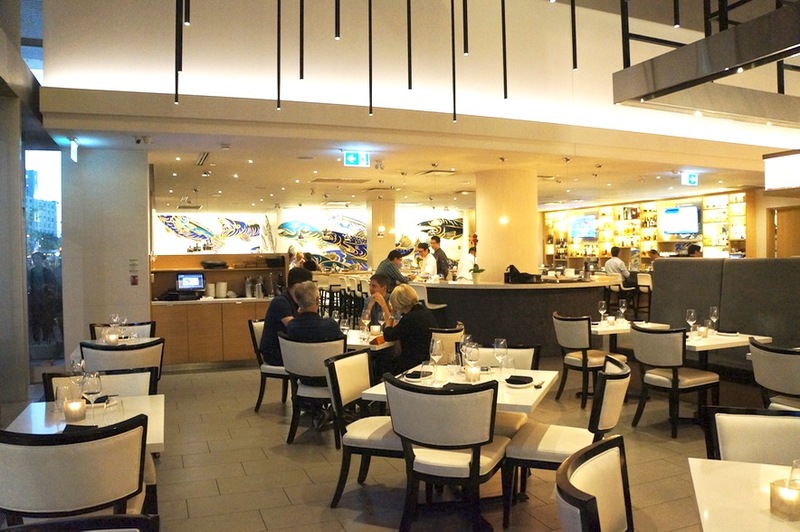 Like the location in Vancouver, the restaurant is very large and has a very similar look and feel – just minus the waterfront view. The interior feels very light and airy with high ceilings, large glass windows and tables that are very well spaced apart. If you’d prefer to take advantage of the last bit of warm weather before winter falls upon us, Miku also has a large patio for you to enjoy. Miku is part of the Aburi brand of restaurants which also owns three establishments in Vancouver including Miku, Minami in Yaletown and Gyoza Bar. The Miku restaurants and Minami specialize in aburi sushi (flame-seared) paired with unique sauces. 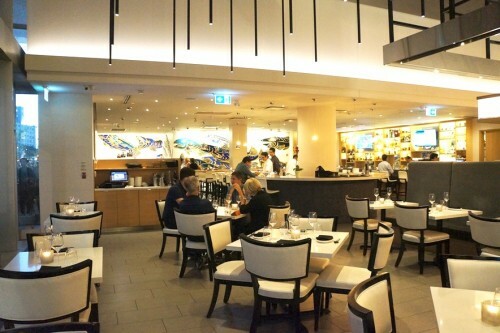 You really can’t go wrong with ordering any of the aburi dishes here. The menu here is quite extensive with appetizers which include beef carpaccio and smoked soy grilled octopus, a selection of kobachi (small plates) like edamame and kale goma-ae, seafood platters, hot entrees including prime rib, as well as sushi and specialty rolls. Prices are on the higher side with appetizers ranging around $15-$25, entrees at $30-$40 (with the exception of the butter poached lobster coming in at $60) and the aburi oshi sushi and specialty rolls hovering around the $15-$20 mark. 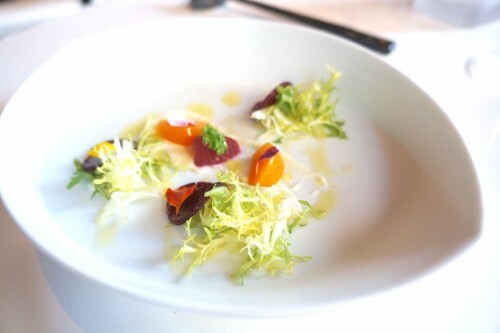 Amuse Bouche – beet tartare with yuzu crème fraiche and micro greens. I’m a big fan of beets and the pairing of it with the light yuzu crème fraiche made it a great way to start off the meal. Course 1 – sashimi, sushi & assorted appetizers. I’m a girl who likes variety and I thoroughly enjoyed each bite-sized component of this course. I started with the box containing the raw fish which was accompanied by two types of soy sauce – a traditional (saltier) version and a sweeter, fuller-bodied version meant to be paired with fattier fish. 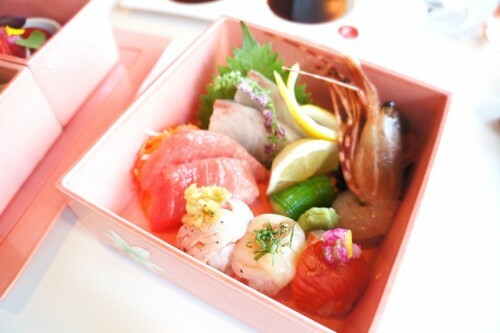 The box consisted of several pieces of sashimi – chutoro (medium-fatty tuna belly), mackerel and shrimp, and three nigiri – salmon, scallop and albacore tuna. 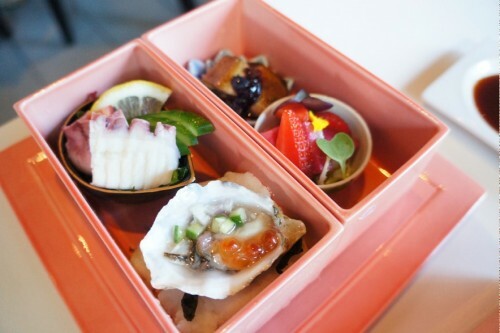 The other box consisted of a kusshi oyster, octopus, seared foie gras with a berry sauce and a summer salad. It was a really great set of delicious bites. Course 2 – sablefish with miso and a sous-vide lobster tail. The sablefish (aka black cod) was cooked perfectly and the pairing of it with the miso was a classic combination. It’s such a buttery fish that makes it taste very rich. We also really enjoyed the lobster tail which wasn’t the least bit chewy. The fish and lobster were accompanied by a piece of chicken skin and a piece of potato. The potato looked like a pretty plain boiled potato but holy smokes, was it ever packed full of flavour. I don’t know what they did to that potato but it was the sleeper hit of the dish! 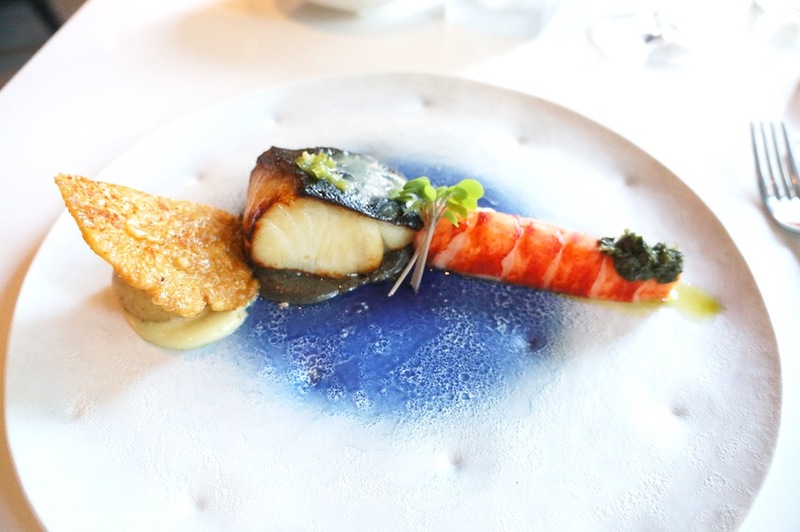 Course 2 – Sablefish and a Sous-vide Lobster Tail. 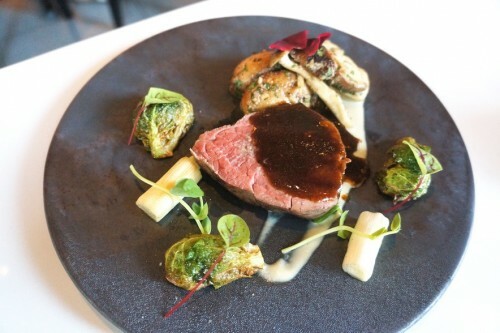 Course 3 – sous-vide tenderloin with a veal jus reduction. Just as I’d expect from any meat cooked sous-vide, the knife cut through the tenderloin like it was butter. Everything on this plate was so delicious. From the medium-rare piece of meat to the sautéed mushrooms and the spectacular shallot puree (which I pretty much licked off the plate, I might add). The chefs in the kitchen definitely know what they’re doing. Course 4 – aburi. The aburi course consisted of shrimp oshi, salmon oshi, Japanese uni, otoro with truffle, flounder, salmon with grapefruit and a Miku roll. Like I said, you really can’t go wrong with the aburi here. The torching of the fish really brings out their flavour and we really enjoyed the modern toppings and sauces. Absolutely delicious flavour bombs – but certainly not for sushi purists. Course 5 – Valrhona chocolate & green tea lava cake. The decadent cake wasn’t overly sweet and I could definitely taste the green tea in it. As I cut through the cake, the warm filling spilled out onto the plate. Getting a bit of cake, gooey filling and cold ice cream into each bite was key. Loved it. 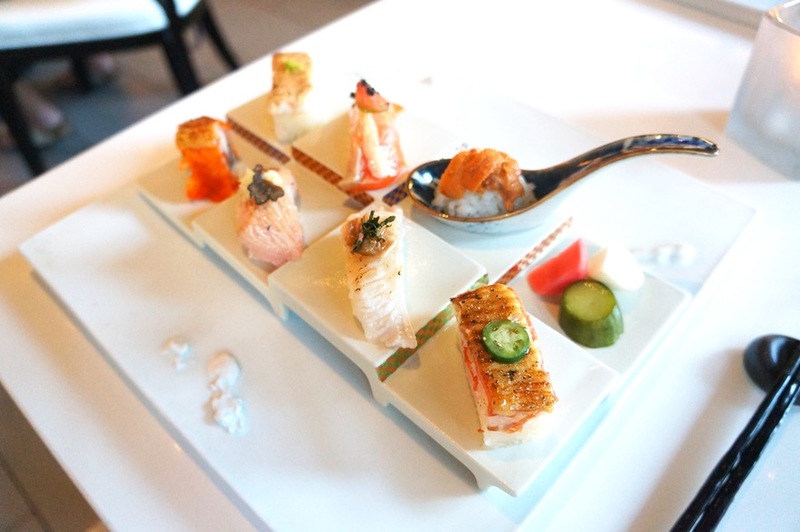 Overall, we enjoyed our Aburi Kaiseki tasting at Miku. While the sushi and sashimi courses were undoubtedly delicious, we were even more impressed with the hot food from the kitchen. 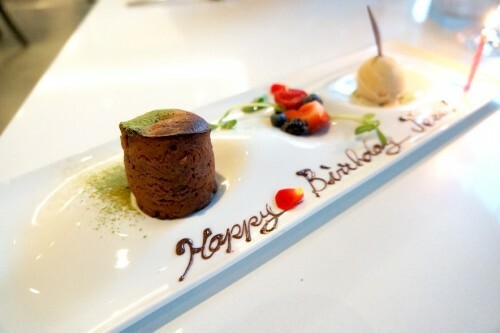 The tasting is such a wonderful treat for a special occasion – you’ll definitely leave satisfied!